Pink Lady's Chewy Caramels will give you many quiet moments - because your teeth will be stuck together! 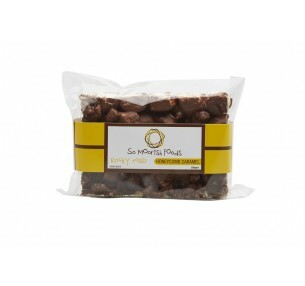 Firm, creamy caramel squares covered with smooth milk chocolate. INGREDIENTS: Milk Chocolate (40%) [Sugar, Cocoa Butter, Whole Milk Powder, Cocoa Mass, Skim Milk Powder, Emulsifiers (Soy Lecithin 476), Flavour (Vanilla)]. Sweetened Condensed Milk (Milk, Sugar), Wheat Glucose Syrup, Sugar, Milk Fat, Golden Syrup, Salt, Flavours, Emulsifier Soy Lecithin). Milk Chocolate contains minimum of 34% Cocoa Solids and a minimum of 27% Milk Solids. 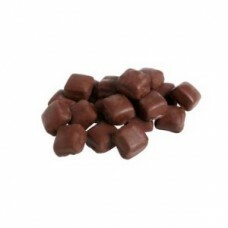 So Moorish Foods Honeycomb Caramel Rocky Road is the most popular flavour for good reason:..